How beautiful, JM. A stunning composition. 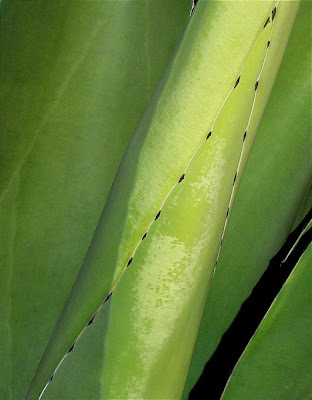 Julie has taken a photo or an agave close up that she has not yet posted. It will be an interesting comparison with yours, as it is a slightly different species. You two had a similar inspiration. That's beautiful. It almost looks like fabric trimmed with black stitches. This is different, so beautiful green! That looks like a prickly subject! Great photo. You do wonderful nature photography JM. I pop by your other blog every now and then just to savour the delights. I like the smoothness of this and the various subtle shadings! It's a good think you told us what it is, though, as I don't think I could have guessed! YOu always amaze me. This is such a great macro shot. Very nice. Kind of abstract looking. Shades of green and a barely perceptible geometry. Daring subject, beautiful image. I have a beautiful Agave but I have to keep it in the house. Our winters are too wet and it just doesn't like wet feet (roots).